Come learn about The Principles of Our World. In a series of real-life stories, readers will be introduced to The Principle of Sacrifice. 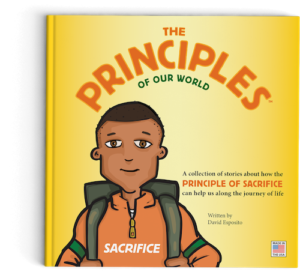 The stories in this children’s book are meant to remind all of us about the importance of sacrifice in our lives. Enjoy the book in one sitting or read just one story at a time. “Hello, I am The Principle of Sacrifice. “People say that I am the reminder about how life is not always easy and that we need to be prepared to make difficult choices today to make sure things are better tomorrow. “People also say that I remind them to think about others instead of themselves. Putting the needs of our family and friends ahead of our own help to make our relationships stronger. “I had a basketball coach once tell me, ‘No Pain, No Gain.’ He meant that without hard work and a little bit of pain, there was no way someone could expect to win in a big game. He said because I worked super hard in practice, he knew I would do well in the games. That is why he gave me the nickname Sacrifice. People have been calling me Sacrifice ever since. “I am now serving our country in the Army. I have seen a lot of people make sacrifices for the country. The sacrifices I learned to make as a young kid helped me to make even bigger sacrifices as I grew older. “Please call on me when you need some encouragement to make a difficult choice today, so that you or someone else can have a better tomorrow.